Many of the watersheds in British Columbia (BC) are fully allocated or will be in the next 15 to 20 years. 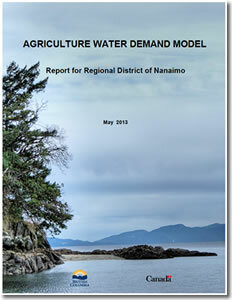 The Agriculture Water Demand Model (AWDM) helps to understand current agricultural water use and helps to fulfil the Province’s commitment under the “Living Water Smart – BC Water Plan” to reserve water for agricultural lands. The Model can be used to establish agricultural water reserves throughout the various watersheds in BC by providing current and future agriculture water use data. Climate change scenarios predict an increase in agricultural water demand due to warmer and longer summers and lower precipitation during summer months in the future.